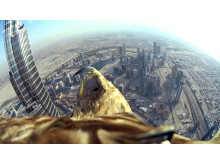 Using cutting edge technology - one of the world’s smallest action cameras, a Sony Action Cam Mini - the flight recorded an extraordinary bird’s eye perspective of the landscape, capturing unique footage. 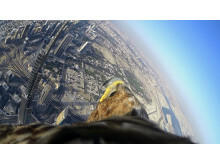 The Imperial Eagle’s flight from the top of Burj Khalifa, which stands at a height of 829.8 metres, 2722 feet, represent a world first and sets a new world record as the highest recorded bird flight from a man-made structure. The charity Freedom Conservation works in collaboration with a leading conservation initiative, SOS (Save our Species) and UNESCO to raise awareness of the plight of threatened wildlife, many of which are recorded on the IUCN Red List of Threatened Species. Darshan the Eagle, who has set the new world record, is an example of a threatened species, which has been successfully rehabilitated through global conservation programmes. He acts as an ambassador for threatened animals all over the world. The Imperial Eagle, once on the Red List of endangered species, has been saved from extinction. 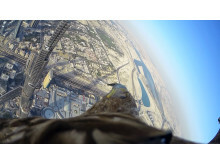 Birds of prey are rooted in the heritage of culture of the United Arab Emirates – the Golden Falcon is the nation symbol of the United Arab Emirates, and Dubai firmly supports international effort in protection of threatened species such as Freedom Conservation. Despite its rapid development as a major regional business centre, Dubai has long recognised its responsibility towards preserving its environment, mainly its unique desert habitat. Over the past three decades, many natural reserves, along with several laws, have been established to protect threatened animals. The United Arab Emirates, in general, has always been active in conservation of threatened animals, creating over 15 natural reserves around the country and planning a number of rehabilitation programmes. 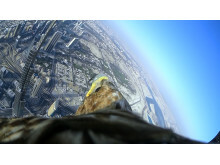 Freedom Conservation’s Eagles have flown from iconic landmarks across Europe, including the Eiffel Tower in Paris (301 m) and St. Paul's Cathedral in London, recording unique footage that have attracted record audiences to its conservation efforts. 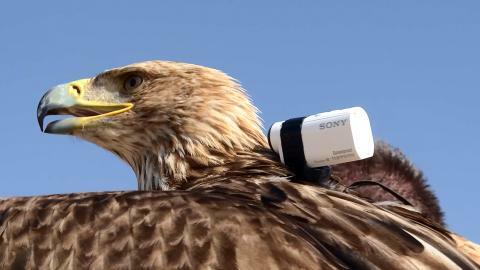 Images recorded by Freedom’s Eagle were the most viewed online animal images of 2013/14. Freedom’s Eagles are trained by world-renowned falconer Jacques-Olivier Travers, who has pioneered new techniques to increase the reintroduction rate of threatened eagles to the wild, that include paragliding, skiing and kayaking to teach vital survival skills. 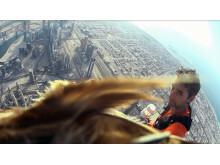 He has since been dubbed ‘The man who teaches Eagles to fly’. Sony is working with FREEDOM as an official sponsor, to help them achieve their goals of re-introducing the White-Tailed Eagle into its natural habitat in the French and Swiss Alps. Sony is providing its Action CamTM camcorders to FREEDOM to allow them to accurately document the flights of white-tailed eagles. FREEDOM is looking to use this footage to learn from the behaviours of the eagles to better understand the work that needs to be done to best prepare the terrain for their re-introduction. The technical capabilities of the Action Cam by Sony in being able to deliver smooth Full-HD video content, benefitting from Sony SteadyShotTM technology, coupled with the ability to overlay GPS data on the captured footage means that it is the ideal tool for FREEDOM to gain the insights that they need to conduct their work. 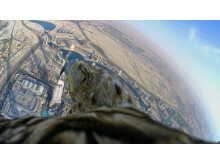 Furthermore, the small size of the Action Cam camcorders means that they can be easily attached to eagles and not restrict their natural flight in any way.